Certain ghosts are masters of manipulation. That's just what happens when you haunt a house of psychiatry students for years. You learn to think three steps ahead of your haunting victims. A witty ghoul like this one wants to inflict more than goosebumps and sleepless nights on its victims! It wants to change their life drastically. It might frame someone for a murder... little does everyone know the diseased died decades ago. Then, while the investigation goes forward this undead deceiver will plant evidence in incriminating places, casting doubt in the hearts of everyone who's nearest and dearest. And who knows, if the framed victim gets wise and acts like they miss the ghost, their name might be cleared. In the meantime, we're pretty sure this ghost's type of haunting beats a Poltergeists' pile of chairs any day! 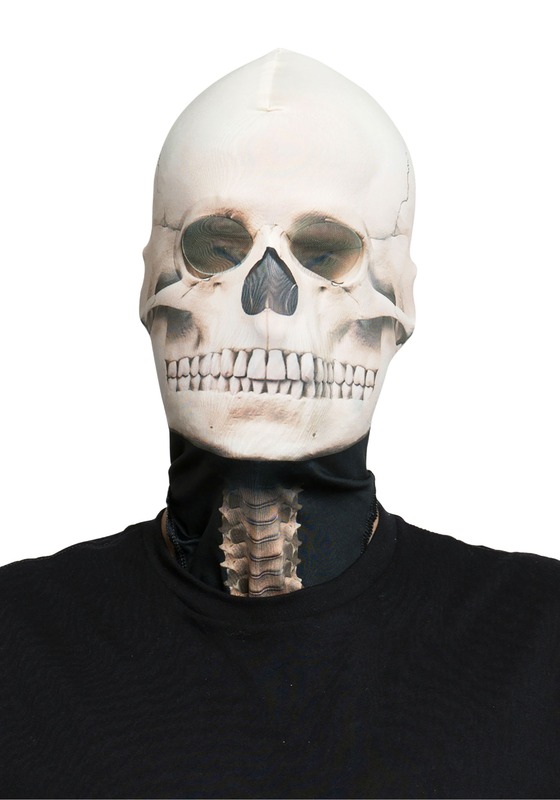 You don't have to deal with hard plastic molding or smudgy paint to get an awesome skull look for your next costumed event. This mask slips over your head with a look that's both opaque and breathable. The mesh eyeholes keep you disguised while allowing you to see the world. We're excited for you to get out there and be the best ghost you can be. Just be sure you live up to the opportunities your mask gives you! No standard "boos" and "oohs" for you. A visit from you is sure to cause real-deal chills!